Maar hier ook een recent studierapport over 27 jaar ervaring met Moh's surgery - Moh's operatietechniek in Mexico. Een operatietechniek die toch relatief vaak wordt toegepast bij huidkanker in gezicht en hals of op het hoofd i.p.v. het vaker gebruikte PDT - Photo Dynamische Therapie. Zie dit studierapport: Mohs micrographic surgery: 27 year experience in the Northeast of Mexico dat wel gratis is in te zien. Onderaan dit artikel staat abstract en referentielijst. Beeld hieronder is uit studierapport gehaald. Tekst gaat onder beeld verder. Mohs surgery - Mohs operatietechniek zorgt voor beste resultaten bij het behandelen van huidkanker, maar wordt slechts mondjesmaat toegepast omdat deze operatietechniek meer tijd kost en veel duurder is dan bv. PDT - Fotodynamische Therapie = lichttherapie of standaard operatietechnieken. Deze week publiceerde The Lancet een artikel over een gerandomiseerde en dubbelblinde studie die bewijst dat Mohs surgery het beste resultaat geeft bij huidkanker - basecellcancer. Het beste resultaat zowel in kans op recidief, als definitieve verwijderen van de kankerplek als in cosmetisch opzicht. Een patiënt die behandeld wordt met Mohs surgery heeft daarna zo goed als geen blijvende littekens daarvan in tegenstelling tot bv. standaard operatietechnieken. Mohs' micrographic surgery for treatment of basal cell carcinoma of the face--results of a retrospective study and review of the literature. Smeets NW, Kuijpers DI, Nelemans P, Ostertag JU, Verhaegh ME, Krekels GA, Neumann HA. BACKGROUND: The incidence of skin cancer and especially basal cell carcinoma (BCC) has increased in the last decade and is still increasing. Many treatment modalities can be used to treat BCC; surgical excision is the most frequently used. Mohs' micrographic surgery (MMS) is an advanced excision technique which is often used to treat BCC in the U.S.A. In Europe it is practised less frequently. OBJECTIVE: The aim of this article was to evaluate the efficiency of MMS for the treatment of facial BCC. METHODS: In a retrospective study recurrence rates after the treatment of facial BCC by MMS were estimated by reviewing the records of all patients with BCCs (620 patients with 720 BCCs) treated by MMS in our department from April 1992 until December 1999. RESULTS: The 5-year recurrence rates estimated from this study were 3.2% for primary BCC and 6.7% for recurrent BCC. Prognostic factors for recurrence are: an aggressive histopathological subtype, more than four Mohs' stages, a large defect size and a recurrent BCC. CONCLUSION: Based on the fact that MMS provides the lowest recurrence rates, it is the treatment of first choice for primary facial BCCs with an aggressive histopathological subtype and for recurrent BCCs in the face. Op deze website www.mohssurgery.org kunt u alles in het Engels lezen over Mohs Srugery, hoe dit ontstaan is en hoe het werkt. Soms wordt Mohs surgery ook toegepast bij melanomen in beginnend stadium. Mohs surgery has emerged in one of the dermatology reference centres in the North of the country as one of the surgical techniques for the treatment of aggressive carcinomas with high risk of recurrence. Skin cancer treatment includes surgical and non-surgical techniques. Among surgical techniques, Mohs micrographic surgery permits a complete evaluation of surgical margins with maximal tissue sparing. Retrospective review of dermatology database of skin cancer cases treated with Mohs surgery at University Hospital Dr. José Eleuterio González from 1988 to 2015. A total of 546 cases were included, of these 289 (52.93%) corresponded to women and 257 (47.07%) to men. Mean age at presentation was 64.3. 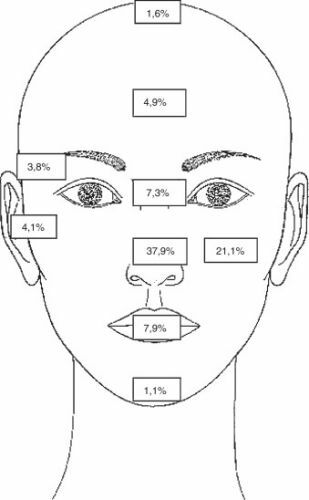 Most tumors (63.2%) corresponded to infiltrative basal cell carcinoma and the majority were located on the nose and cheek; 9.7% of cases corresponded to recurrent tumors. A mean of 1 Mohs stages was used in 56%, with a mean of 2 sections in 23.6%. Cutaneous flaps were used in 47.7%, representing the predominant reconstruction technique. Autor para correspondencia. Universidad Autónoma de Nuevo León, Av. Madero y Gonzalitos s/n, Col. Mitras Centro, C.P. 64000 Monterrey, Nuevo León, México. Teléfono: +(52-81) 8363-5635; fax: +8363 5337. © 2016 Academia Mexicana de Cirugía A.C. Published by Masson Doyma México S.A. Corrected proofs are Articles in Press that contain the authors' corrections. Final citation details, e.g., volume and/or issue number, publication year and page numbers, still need to be added and the text might change before final publication. Although corrected proofs do not have all bibliographic details available yet, they can already be cited using the year of online publication and the DOI , as follows: author(s), article title, Publication (year), DOI. Please consult the journal's reference style for the exact appearance of these elements, abbreviation of journal names and use of punctuation. When the final article is assigned to volumes/issues of the Publication, the Article in Press version will be removed and the final version will appear in the associated published volumes/issues of the Publication. The date the article was first made available online will be carried over. Reageer op "Mohs operatietechniek zorgt voor beste resultaten bij het behandelen van huidkanker, maar wordt slechts mondjesmaat toegepast omdat deze operatietechniek meer tijd kost en duurder is dan andere operatietechnieken of PDT"